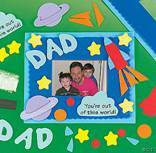 If you have kids or grandkids that would like to get involved in the gift-giving fun this Father�s Day crafting something personal can be the most fun way for both kids and Dad to enjoy a fun gift. Let these ideas get you started and add some flare of your own to make the perfect gift for the father�s you love this year. from About.com, submitted by Lynette K.
when I placed them here today. Be sure to include the child�s name and the date on this cute gift. 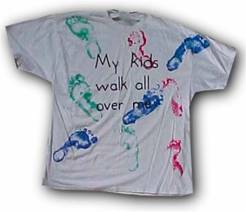 Put some fabric paint on a shallow plastic plate and have the kids step in it and then onto the shirt. This can get messy so keep wipes and rags nearby for cleanup and make sure you do this in an area that can handle a little mess. You can really make this in any of a million ways. You can use a real frame or create your own with decorative papers. For a gift that will hold up a little better I recommend buying a frame (even from the dollar store) and cover it with papers, foam, twigs, shells, sand, sequins, buttons, and whatever other craft supplies you have and like). Fill it with pictures of Dad and/or the kids. With fabric paints and dye markers make a great custom apron just for Dad! You can also include decorated cooking utensils and oven mitts. Using cardstock, papers, markers, paints, and any other craft supplies make a creative little sticky note holder for Dad�s desk. Find a fun way to tell your special dad how much you love them this Father�s Day. 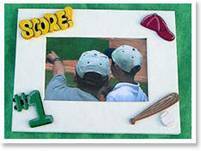 With a little creativity and some time you can create a keepsake that he will treasure forever.